Pierre Koenig studied engineering at the University of Utah in 1943, and architecture at the University of Southern California, where he built his first architecturally exposed steel and glass house while a third year architectural student, in 1950. He began private practice when he graduated from USC in 1952, which continued his entire life. 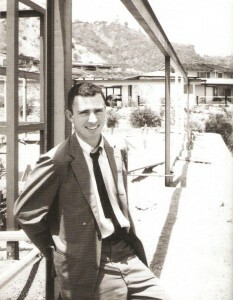 Koenig was barely into his 30s when he received a commission to participate in the Case Study House Program, contributing Case Study Houses #21 (Water Bailey House, 1959) and #22 ( Stahl House, 1960). Featured in an iconic photograph by Julius Shulman, the Stahl House was commemorated as a full-size model in the 1989-90 exhibition Blueprints for Modern Living at MOCA (Museum of Contemporary Art, Los Angeles). Known for his mastery of modern building materials, especially steel and glass, Koenig was also adept at building on difficult sites, such as hillsides. In 1964, Koenig joined the architecture faculty at USC where he worked with Ralph Knowles in designing with natural forces and with Konrad Wachsman as Assistant Director of the Institute of Building Research,1969-71. As Associate Professor since 1970, Koenig was Director of the Chemehuevi Indian Reservation Planning Program from 1971- 78. Pierre Koenig was elected to the College of Fellows of the American Institute of Architects in 1971. Continuing his practice while teaching, Koenig taught various Design Studios and became the Director of the Natural Forces Laboratory and the undergraduate Building Science Program for Architecture at USC, a position he held from 1980 until his death. Renowned equally as a practitioner and scholar, Koenig lectured widely at many notable institutions, including Yale University, Pratt Institute, Arizona State University, Harvard University, Pacific Design Center and LACMA (Los Angeles County Museum of Art), among others. Acknowledged as one of the most significant American architects of his time, Koenig at The Architectural League, New York; Centre Georges Pompidou, Paris; Whitney Museum of American Art, New York and the Sixth Venice Architecture Biennale.